One of a kind, super spacious cottage easily accommodates up to 4 families ! Nestled on top of the rock, the cottage provides spectacular views of the Pigeon Lake. Floor to ceiling panoramic windows in both family rooms as well as the two large decks are overlooking the lake and the views are just stunning! First floor master bedroom and one of the second floor bedrooms have separate balconies with lake view as well. The cottage is located down a private driveway on almost one acre of land, offering loads of privacy among mature trees. It's rated 10 out of 10 for privacy. Enjoy swimming, fishing, boating or just relax of the large dock. The water is shallow at the shoreline and gets deeper at the edge of the dock. The water is clean and breathtaking expanse of majestic Pigeon Lake is within a touch of your hand. And if it’s a little bit (or a lot) chilly outside – warm yourself up in our newly installed, state of the art outdoor Hot Tub and Barrel Sauna. Both are located on the raised platform overlooking the lake. 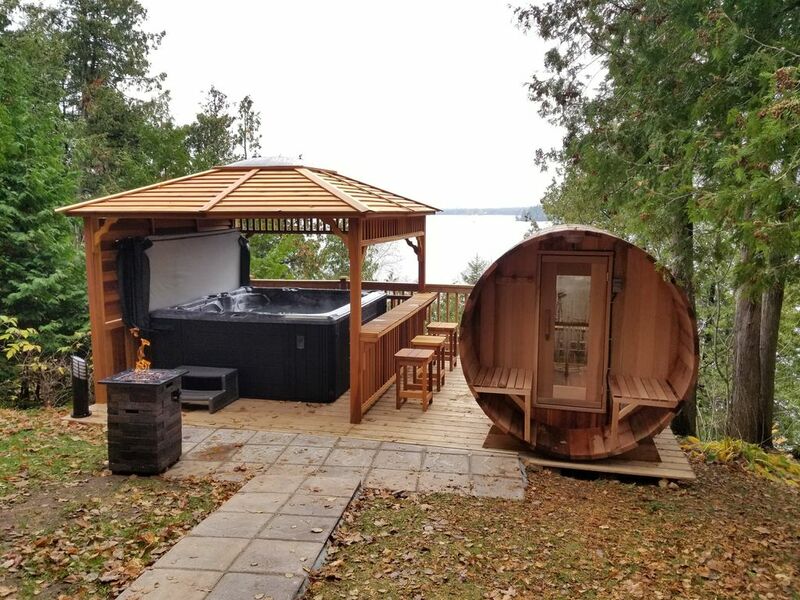 Our premium Panoramic Barrel sauna comes with an acrylic bubble wall facing the serene view of the lake. The house features a fully equipped kitchen that provides everything you need to prepare amazing meals. Dining area is open concept and is facing the panoramic windows for your dining enjoyment. The ceilings in the cottage are all vaulted with large cedar beams that further enhance the look and charm of the open concept living areas. For your outdoor enjoyment and fun on the lake we offer 2 kayaks, paddle boat, canoe, swim ladder at the dock (summer only), fire pit, Muskoka chairs and large BBQ. The cottage is positioned about 100 feet from the lake and has 110 feet of shoreline along with a 6' x 28' aluminum dock that can handle a boat comfortably. Located on Pigeon Lake, our cottage is 2 hours north of Toronto and just a short drive to the town of Buckhorn and just half an hour drive to Peterborough where you'll find all the amenities you need. If you don't feel like cooking, Buckhorn has plenty of authentic restaurants serving delicious food for all taste and budget. Want to visit another authentic town? Half an hour drive and you are in Bobcaygeon with it’s dazzling downtown, boutiques, cottage home décor stores, restaurants, fudge and ice-cream. We (Alex & Sophie) are enthusiastic nature lovers, we love traveling, camping and exploring. We fell in love with this hose the moment we saw it! It can easily accommodate our big family and our friends. Our guests always feel love and care we put into it. The feature that immediately makes you fall in love with the house is the breathtaking lake views from the second floor! We also provide our guests with outdoor Hot Tub and Sauna.